This trend report provides security executives and practitioners with an overview of the benefits of using web-based applications and tools in the workplace and their security risks. Web-based applications are being used by businesses more and more each year for purposes of improved communication with employees and customers, group collaboration, and marketing and publicity outreach. The benefits of web-based applications for business are many, but so too are the risks associated with them. Data leakage, information manipulation, malware, and authentication security are just a few of the cyber threats discussed in this report. It is critical to weigh the pros and cons of implementing a web-based application in the workplace and plan accordingly to mitigate risk. This report is a valuable resource for any security professional who is considering the adoption of a web-based application for corporate use. 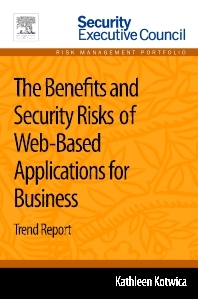 The Benefits and Security Risks of Web-Based Applications for Business is a part of Elsevier’s Security Executive Council Risk Management Portfolio, a collection of real world solutions and "how-to" guidelines that equip executives, practitioners, and educators with proven information for successful security and risk management programs. What is a Trend Report? Kathleen Kotwica has a PhD in experimental psychology from DePaul University and has had a career as a researcher and knowledge strategist. Her experience includes positions as information architecture consultant at a New England consulting firm, director of online research at CXO Media (IDG), and research associate at Children's Hospital in Boston. She has authored and edited security industry trade and business articles and has spoken at security-related conferences including CSO Perspectives, SecureWorld Expo, ASIS, and CSCMP. In her current role as EVP and chief knowledge strategist at the Security Executive Council she leads the development and production of Council tools, solutions, and publications. She additionally conducts industry research and analysis to improve security and risk management practices.